We’ve already talked about Application Virtualization and some common scenarios (Post I), talked about the existing models in App-V and how to install the App-V Management Server (Post II); now it’s time to work with the App-V clients. I was considering to not include this post and go directly to sequencing applications, but most of the errors and blocking issues that appear in App-V are related on not having a environment properly installed. The process will start with the App-V Desktop Client installation. 1. Double click on the installer and most likely you will be needing to install a few components before starting. 2. The wizard starts and click on “Next”. 4. Select your option for Microsoft Update. 5. Select “Custom” installation option. 6. Accept the default installation path. 7. Data Location, the default preferred drive letter by convenience is used the letter “Q” (avoiding to collide with possible network drives). 8. Then you can select the cache size that the client machine will use. Every time that the client downloads applications, it will use the local cache for every time the application needs to be loaded again in the session. You can use the default option provided. 9. On Runtime Package Policy Configuration use the default options adding the “On Publishing Refresh” option inside “Automatically Load Application”. 10. 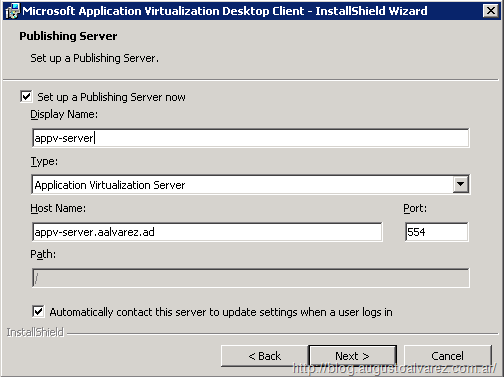 On "Publishing Server” complete the options used for your App-V Server. And since I won’t be using SSL for the communication, I’m selecting the type “Application Virtualization Server” and “Port” 554. 11. Click on “Install” and we are ready to go. As we’ve seen it before, once you install the App-V Management Server a default application is installed. – Ensure that the Application Management Server service has started. – The content folder (C:\Program Files\Microsoft System Center App Virt Management Server\App Virt Management Server\content\) must be shared with proper permissions: “Everyone” the “Read & Execute”, “List folder contents” and “Read” access. – If you have the firewall enabled, ensure that you enable the exceptions for inbound connections with the programs sghwdsptr.exe and sghwsvr.exe. Both located in “C:\Program Files\Microsoft System Center App Virt Management Server\App Virt Management Server\bin\”. To make a first quick check about the connectivity, you should always start using “telnet appv-server 554” to ensure that the ports are open between the hosts. 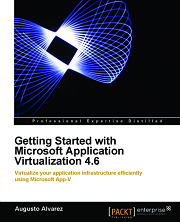 If any of those are not in place, the error code that you should be receiving when you try to access an application is: “The Application Virtualization Client could not establish a connection to the Application Virtualization Server” “Error code: 4513CDC-19D06A0A-10000004”. And in the Event Viewer you’ll see a bunch of warning messages and one error: “The Application Virtualization Client could not connect to stream URL ‘RTSP://appv-sequencer:554/application‘” along with the same error code. 2. With all that in place, time to get the application ready. 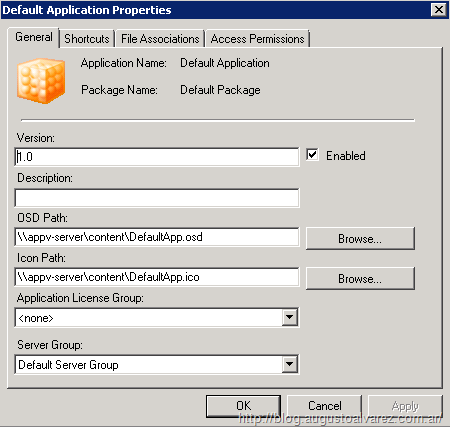 Access the App-V Management console, open the Default Application Properties. 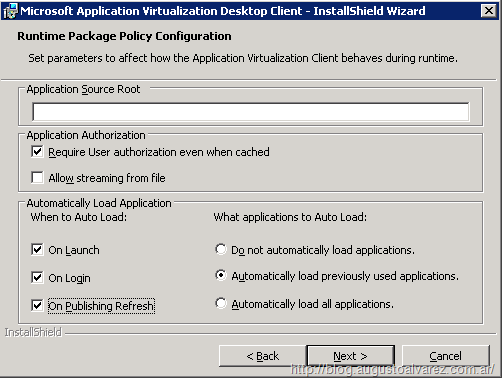 In the General tab, the OSD and Icon path must be using a UNC path, like in my case: “\\appv-server\content\”. 3. Shortcuts tab will let you decide where you want to insert the client’s shortcuts. 4. Access Permissions: Here you can select all the domain groups that will have access to this application. 5. 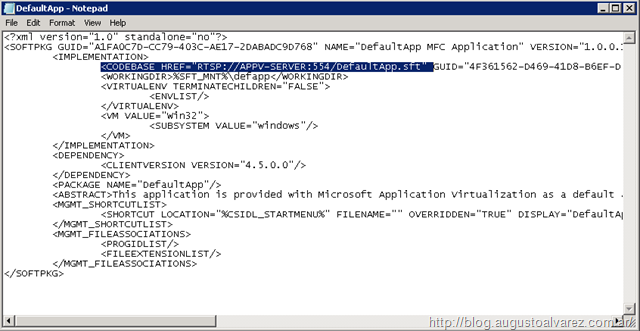 Edit the DefaultApp.osd file that is stored within the content folder mentioned. Look for the “Implementation” area and replace the name of the server using the current name of the actual server. 6. Login to the client machine using credentials that belong to the group you just gave access to the application. You will see the Default Applications shortcuts already in place, double click the shortcut. And there you have it, your environment is ready to receive and launch applications. Remember that by default, the applications are refreshed once the user logins to the client computer. 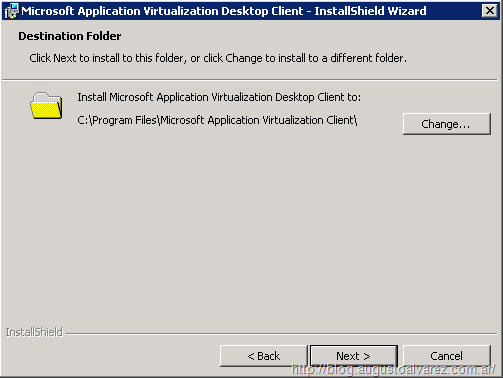 If you want to avoid this process, in the client computer access “C:\Program Files\Microsoft Application Virtualization Client” folder and double click “SftCMC.msc”. 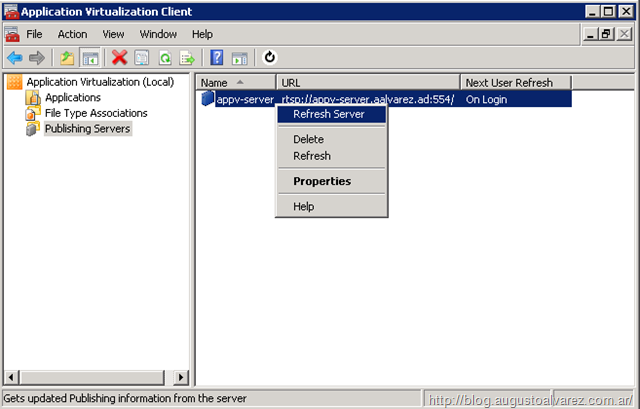 Inside “Publishing Servers” right-click the name of the server and select “Refresh Server”. With that, any update on the applications published should be shown in the client. In a few days more, I’m publishing the fourth part of the series: sequencing applications. Whenever i try to install the Client I get an error…. 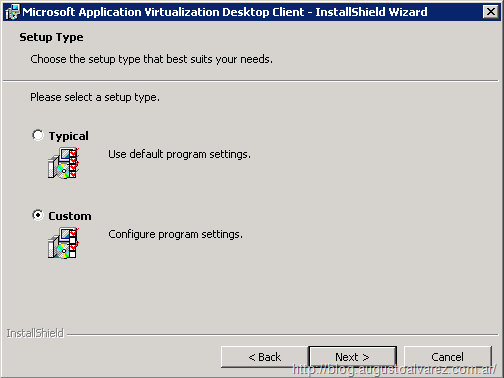 Error 25001.Microsoft Application Virtualization Client for Remote Desktop Services requires that Remote Desktop Services is installed on the system. How can I fix this, as far as I know all updates are installed and the RDS 7 is installed on XP clients. I have both XP Pro and Win7 Pro clients, and this same error comes up. You seem to be using the App-V Terminal Services Client instead of the App-V Desktop Client. Those are two different set of installers. 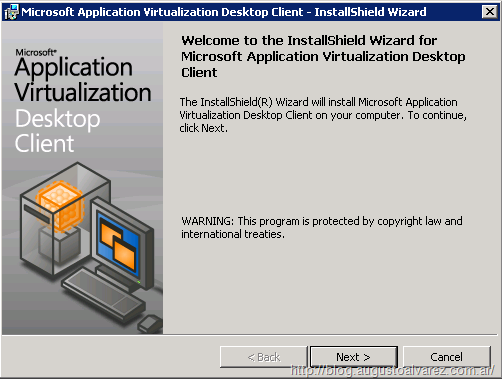 I have downloaded the App-V 4.5 from the Microsoft Licensing site, and in the Installers>Client folder, have tried to install the SETUP.EXE, which does install the prerequisites as shown in your tutorial, however, I also get the “Error 25001.Microsoft Application Virtualization Client for Remote Desktop Services requires that Remote Desktop Services is installed on the system.” I downloaded the MDOP 2011 and apparently the App-V in there is still the old one called Softricity, and the WD version installed ok on my client computer, but the screen shots do not look like yours, of course. Where do I find the App-V Desktop Client? I have searched everywhere and have wasted numerous hours trying to find it! It is not easily available on the Licensing website. Thank you. Make sure your not downloading the client for RDS… You want the desktop client. Thanks!! I also getting the error 25001 with the above stated condition. otherwise can u please send me the link to download free App-v desktop client…. 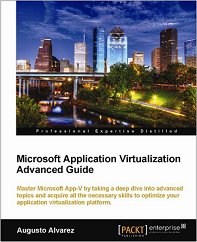 Unfortunately there’s no free App-V Desktop Client, you need to download the MDOP package from Microsoft. Using an MSDN or Technet account will do. Are you using RTSPS? 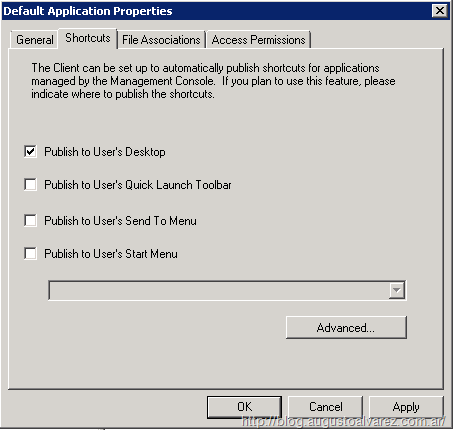 Did you check: http://blogs.technet.com/appv/archive/2010/03/09/troubleshooting-common-rtsps-issues-with-app-v.aspx ? Awesome Blog and some really great info, thank you! I have been following your Blog creating my own App-V proof of concept and just thought I’d give some feedback. Firstly, in Testing the Default Application Step 4. 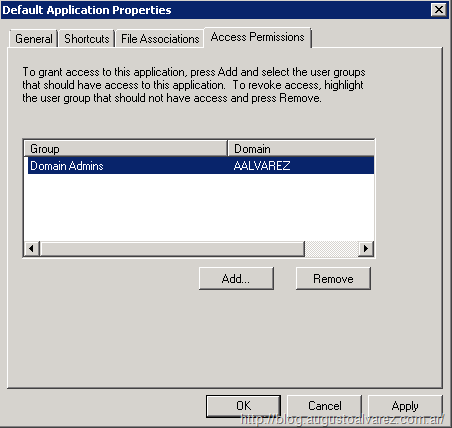 Access Permissions you also need to make sure the Group or User you are giving access to use the application is also defined in the default provider policy. You indicated in Part II you would change this for each application but it’s not clear when following Part III. Second, which also answers Dujons question, when you indicate you need to change the DefaultApp.osd file for the default app, you advise to change the server name for where the content is stored, also by default the .osd file specifies RTSPS as the protocol, so this also needs to be changed to RTSP and port number changed to 554 to get this to work. Just for those dummies out there like me whom follow things to the letter and can’t get this to work…. Thanks a lot of your comments! Regarding the second note, that is correct since the latest version of App-V by default includes the RTSPS protocol in the DefaultApp.osd. this is an awsome set of posts…this became very helpul…i did not get all that time to read everything but want to know if app-v is capable of intergrating with windows embedded systems. When I try to connect to my APPV server I receive this error: “The Application Virtualization Client could not update publishing information fron server-servername-. 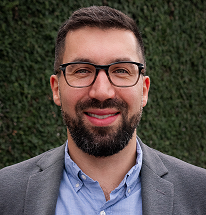 The server will not allow a connection without valid NTLM credential. report the following error to your system administrator. I’m try to connect to the server from my personal computer at home. But when I go to the even log in the server I see that when I’m try to connect to the server it says unknown username or bad password. Did you check the App-V blog where they have the workaround for this issue? 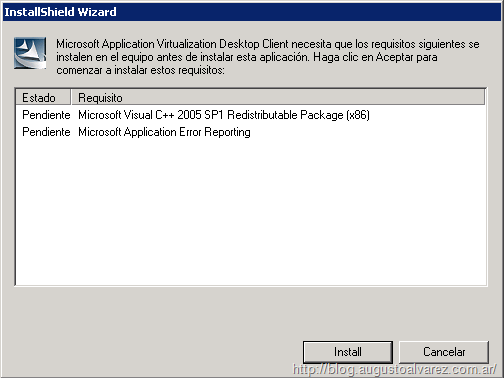 The application Virtualization Client could not update publishing information from the server . A network operation did not complete in time.Check your network connection , and then try again. Error code: 4604EEB-19D0810A-10000005. This happens only if im freshing the server after publish 6 or moreapplication but if i am refreshing after publishing 5 or less applications then i dont get any error, everything works fine. i can’t find a solution on the net…. The Method 3 could be your scenario. I have tried that solution, increased the timeout to 90 seconds, then 120 seconds but it did not work for me. Did you try setting it to 300 seconds? I’ve set up the server, everything seems to be running fine there. I installed the client, found it couldn’t telnet through 554, so I created an allow in the firewall of the server and now telnet connects. I’m also seeing no applications in my App Virt Client on the client PC. Did you check the App-V log or the Event Viewer and verify if there’s no warning there about the communication? Did you try the DefaultApp from App-V to test the communication? In the application properties, it had a drive letter instead of the \\servername. What is the exact error you are receiving? In the Event Viewer or Client log you’ll get the full description. Did you try the DefaultApp from App-V? The Application Virtualization Client could not connect to stream URL ‘rtsps://SRV-DSK-APPV1:554/DefaultApp.sft’ (rc 19D0810A-10000005, original rc 19D0810A-10000005). 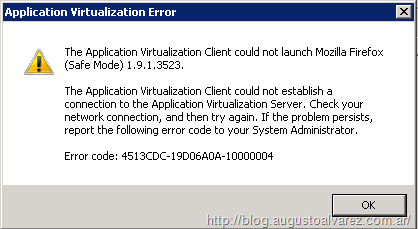 The Application Virtualization Client could not launch DefaultApp MFC Application 1.0.0.1. A network operation did not complete in time. Check your network connection, and then try again. If the problem persists, report the following error code to your System Administrator. Did you notice that you are using RTSPS protocol? If you didn’t import any certificate and you did not configure the secure protocol for streaming, natively you are using RTSP. 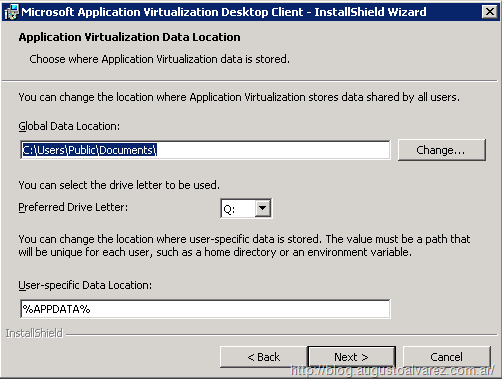 Change that value in the OSD file for the application and clear the App-V Client cache. Is there any way to make RTSP the default? Also, every time, it takes quite some time to do a “checking for updates”. I’m rebooting the PC to try again, but the event log is showing an error that it can’t talk to the application server. Still getting an error in the event log that it could not connect (in one) and in another error, could not connect to stream. A network operation did not complete in time. Check your network connection and try again. Check the Event Viewer / log and verify that you are not using the RTSPS protocol and that the RTSP appears as the protocol from which the client is connecting to the server. I would also verify that the content folder has all the necessary read permissions (NTFS and shared). Not sure why it’s trying to use a Guest account. I think I got the fix, at least for the default application. I had one port set to 554 and the other to 544. Now, the second app (WinZip) still doesn’t work, says it can’t find the package. Oh well… there’s always tomorrow! 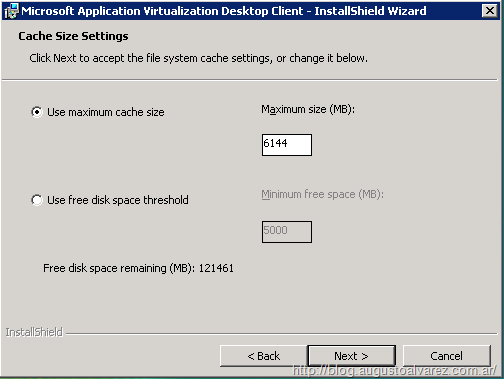 Did verify in WinZip OSD if the path and port is correct? Did you clear cache in App-V Client? Yes, that’s the first thing I did when I got the default app to work. How do you clear the cache in the client? I just “refresh” the server. Ok, when I sequenced, WinZip, it made a folder on my desktop (that’s where I told it to put it), that has the osd files, the winzip.msi, the sft and sprj files and icons. I put that on the server. It also installed to a Q: drive on that PC which has the normal WinZip executable and all the other files it needs to run normally. That folder doesn’t go on the server, does it? If you placed the folder created (where the SPRJ is stored) within the content folder (meaning that you have \content\winzip structure), remember that the RTSP path included in the OSD must be rtsp://server/wizip/winzip.sft. Review the Part IV of this series to check the publication process. Got it to work! You and your website are the best Augusto!!! New Problem now Augusto (and I bought your book!). If I log into the client PC as a domain admin, all works fine. If I log in as a normal domain user (who is a member of the App-V Users Group), I get an error on the client when I try to refresh server of: The Application Virtualization Client could not update publishing information from the server (insert servername here). The server could not authorize you to access the requested data. Maybe you can check your shared directory and NTFS file/directory permission. Last time I met this problem is that I just create the shared permission only. Thanks for all the posts… Good work! App-V Management Server does not support publishing to computer objects instead of groups, the supported approach is using MSI and Group Policy to accomplish this. You’ll get some kind of central administration using GPO, but you won’t be able to do it in App-V Management Server. our Clients are using sequenced MS Office and everytime they want to open a save word doc for example they have to open it through opening a MS Word Document. By default it doesn’t show with a word icon neither. if not they shall open it through “open with” and selecting Application Virtualisation Client which would also bring up “Choose Application” each time they wanna open it. is there any way you can open it and recognize with the right Office App Icon by default.